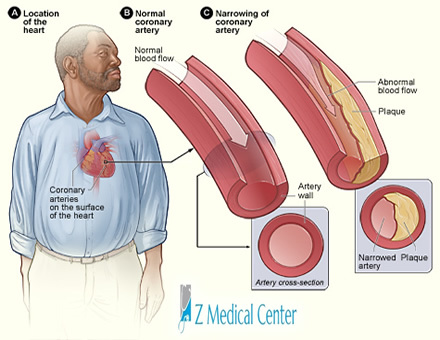 Coronary artery disease is a disease in which the blood vessels damaged with a waxy substance called Cholesterol-containing deposits (plaque), that blood vessels supply oxygen-rich blood to your heart. 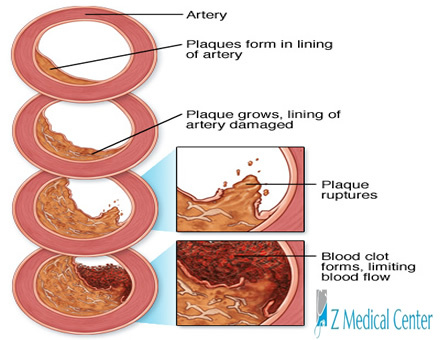 When this plaque grows up in the arteries, it made thin your coronary arteries which reduce the flow of blood to your heart and that whole condition known as atherosclerosis. Chest Pain: Sometimes it is called angina, in that symptoms you will feel pressure on your chest or stiffness in your chest and this pain occurs in the center of chest or on the side of heart (left side of chest). This pain caused by emotional anxiety, tension or pressure or strong physical exercise. This pain does not continue for long time and just disappear right after finishing the stresses activity. In that case, Woman will feel pain in the arm or back or also may be in arm. Shortness of breath: When you are on exercise or activity just like it, you heart needs to beat hard and need to fast the flow of blood according to body’s need but if there is plaque in your coronary arteries, it would not do that and you will suffer shortage of breath or large amount of fatigue with physical exertion. Heart attack: When your coronary arteries blocked completely with plaque and clot of bloods by which your blood flow goes limited and could not meet with the needs of heart beat then you will feel pain or pressure in chest and shoulders with shortage of breath and this whole condition will take you to attack of heart. Test your blood on routine basis. Test of pressure or stress. Eat healthy food or diet. Try to remain yourself calm mostly instead of remain in stress all time. Involve yourself regularly in physical activities.